Ajeetdev Kaur bidrager til dette formål ved at tilbyde undervisning. Du kan læse mere om Ajeetdevs undervisning til højre. Ajeetdev is certified Kundalini Yoga Instructor (KRI 1) of the I-SKY group. Presently studying KRI level 2 certification and has graduated 4 of the 5 modules: Conscious communication, Vitalitet & Stress, Mind Meditation, Authentic relationships. She holds advance studies in Body Phycho Therapy, Qoya - Femine Yoga Dance, Women’s Leadership and Visionary Coaching. After a serious accident in 1998, she was left paralysed in both legs and partly in her upper body. She has turned a human life tragedy into an opportunity to grow and heal. She has learned to use yoga and energy medicine to create sensations and movements in both legs and since fall 2016 to walk on new. Over the years, she has made it her mission to show others the magic of soul connection and spiritual healing. 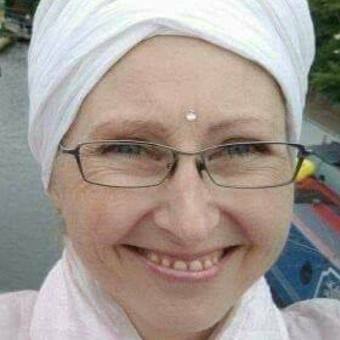 Since 2016 she is the chairwoman of The Danish Kundalini Yoga Teacher Association. Ajeetdev teaches yoga and gives public motivational and tranformational speaks.